The Nagasaki Peninsula is a long, straight, and narrow peninsula projecting southwestward roughly 25km into the East China Sea from the complex western coast of Kyushu near the city of Nagasaki. 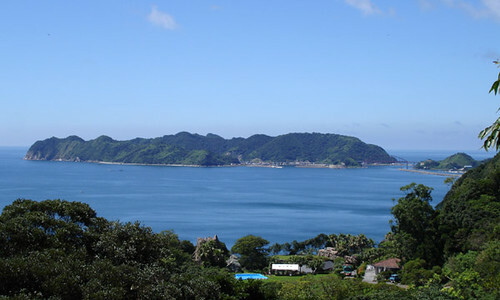 The peninsula forms a prominent landmark on clear days when viewed from the north-west coast of Amakusa’s Shimo Island, our frequent stomping grounds. 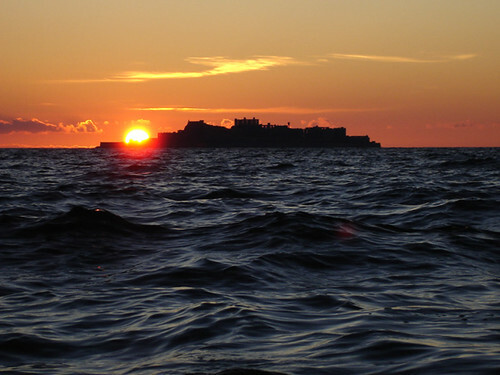 More than 20km away across the mouth of Tachibana Bay, this finger of land had had been beckoning to us for some time. Driven by curiosity and a need to train for long crossings in oppressive heat before our summer vacation tripping, we paddled to the peninsula at the end of July this year. We departed Tomioka beach in the predawn darkness, to match our traverse to the residual tidal current from the nearby Hayasaki Strait as well as to avoid the worst of the day's impending heat. 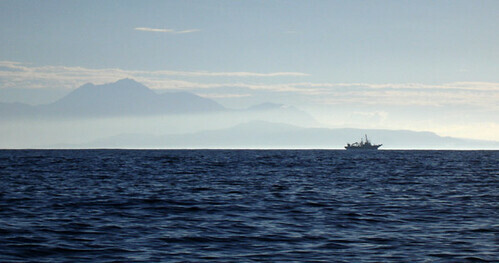 As the sun rose we were already well out to sea, able to look at Amakusa and Mount Unzen from a new perspective. The current helped us and we made a fast crossing of a little over 3 hours. It was still early morning when we made landfall on the other side. 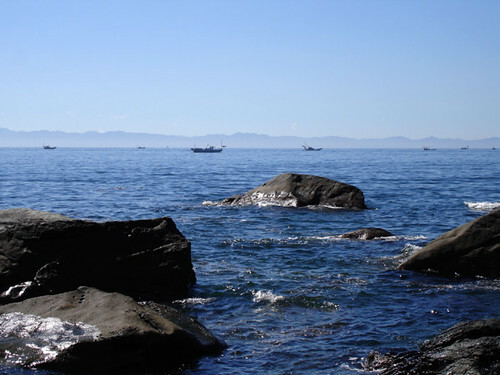 Numerous fishing boats were scattered in the vicinity of the coast, while Amakusa’s steep western hills appeared as a distant monolithic wall beyond the calm stretch of the sea we had just crossed. The sun and the sea shone brightly and it was already hot; we took a dip in a cool stream that happened to join the sea near our landing point. 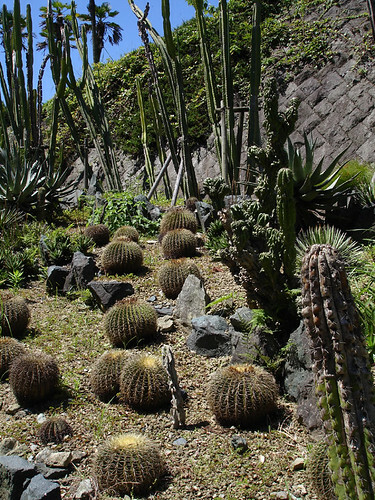 Continuing a little ways southwest along the coast, we came upon a lavish, extensive botanical garden. Due to its southerly exposure and the moderating influence of the sea that surrounds the peninsula, it has a relatively mild winter climate. Somebody had the bright idea to take advantage of this to increase tourism in this otherwise dead-end area. Maybe they hoped for an overflow of tourists from nearby Nagasaki, whose attractions (old european traditions, the atomic bomb museum, trips to outlying islands) cannot be denied. This garden's success was, however, difficult to judge. In any case there didn't seem to be many visitors around. Perhaps they come in masses at certain times of year, as dictated by the highly seasonal nature of the Japanese style of travel. Be that as it may, we pulled the boats ashore and took a leisurely walk through the compound. 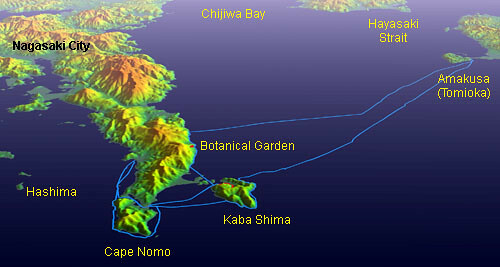 The southwest extremity of the Nagasaki Peninsula is called Cape Nomo. Weathering storms during both winter and summer, its coast and outlying rocks are very steep and scenic. Weather instruments at the lighthouse (recently interfaced with the Internet) often report local extremes in weather. Navigationally, the end of this landform is the small island of Kaba-shima, lying just south of Cape Nomo. Here is situated a beefier lighthouse that casts its bright beam for many miles into the East China Sea, aiding ships circumnavigating Kyushu or entering Japanese waters from the open seas to the south and west. Its bright flashes are of course easily visible from a wide sweep of Amakusa’s west coast. For no other reason than having seen it from afar on so many prior occasions, the island had assumed a certain air of fascination for us. So, we next aimed our boats towards its only port and village. We found the tiny town pleasantly old-fashioned. The ever scenery-devouring Japanese construction machine has left ample mark of course, but the lives of the local people remain closely linked with the sea, and much unchanged. Everyone was busy around the concrete port processing the morning’s catch, mending nets, or getting ready to go out on the sea again. Besides the village area - in large portion on land reclaimed from the sea - there place is very hilly, so not much rice is grown. 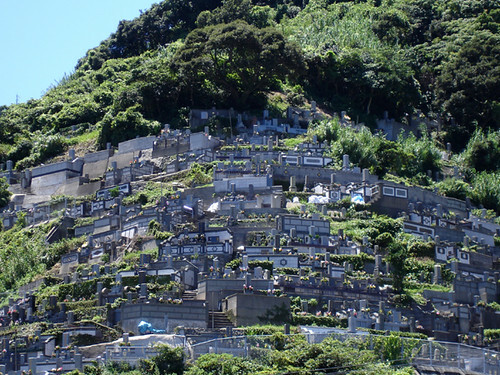 Probably for former lack of space, the local cemetery was built into the hillside steeply overlooking the village. We took a short stroll into a tight valley cramped by old village houses, to see an unusual attraction: a glass tank with two very large eels in it. This subtropical species of fish is at the northern limit of its habitat here. These eels had migrated by sea, ascended the creek during floods and were living in the local fresh water reservoir. They were discovered when a flood broke the dam, and two of them had since been kept here on live display. After some more time spent drinking cold sodas in the shade of the ubiquitous wisteria trellis in the park, we finally re-launched our boats and headed west and north around Cape Nomo. Here the sea horizon opens, with no significant land out there for 1000km or more. Due to settled weather there was only a little swell coming in. Apart from what one might expect in such a place, he sea seemed murky and the drying rocks and shoals smelled, well, not exactly like a pristine coast might have. A satellite image later showed the reason for this apparent anomaly (see below). A false color satellite image - data are from the NASA Modis-Aqua satellite - show the relative concentration of chlorophyll (nutrient rich, murky water as red; nutrient poor, clearer water as green) in the seas around Amakusa on Aug. 1st, 2006, the day after our excursion. A plume of murky water is seen flowing out of the Hayasaki Strait and upon impinging upon the Nagasaki Peninsula, enveloping its coasts. 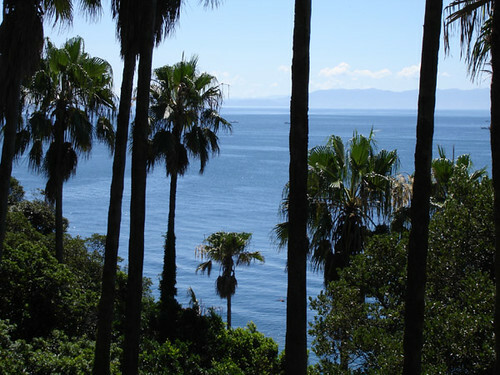 Meanwhile, the southwest coast of Amakusa enjoys clear seas due to water streaming in from the south. Rounding the cape at low water, we enjoyed cruising through the extensive rock gardens there, darting through the gaps between the rocks amidst the moderate waves. I noticed that a small fishing boat was tracking us from outside the shoal zone; the lone fisherman on board not being able to safely steer his boat any closer to us. 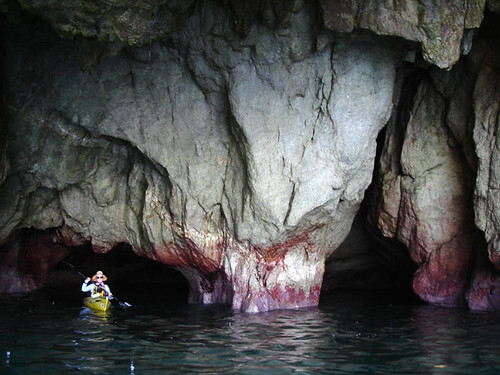 When we finally came to the rocks’ end, he quickly brought his boat alongside and with great zeal expounded on the dangers of being there, quite failing to see that we were in fact quite safe and comfortable. 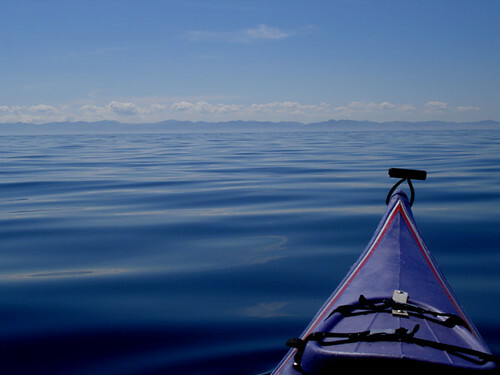 This kind of thing happens from time to time; Leanne says they are only naturally concerned, but even given they had never seen a kayak before, they could learn to be perhaps a little calmer and a trifle more observant. Around the cape the curious island of Hashima became visible. Home to a coal mine in the past, this tiny island is now a very odd ghost town of thickly crowded concrete derelicts: all coal here had been mined out nearly a century ago. The artificial-looking island presents an eye-catching profile, and it is said that in WW2 the invading Americans, mistaking it for a battleship, shelled it awhile from a safe distance before realizing their error. We decided to camp at a public beach on the mainland, presently turning our bows thereto. Crowds of people there were enjoying the start of the customarily short bathing season, but would disperse for the night, leaving the place deserted. The scorching hot day ended in a bright sunset silhouetting Hashima. Distant mountaintops on Gotou's Nakadori Island were seen at sunset from the Nagasaki peninsula. After the dramatic sunset we spent a peaceful night, packed up fairly early the next morning, and soon embarked on the return leg of our weekend trip. The peninsula pinches off to a 200m wide isthmus at the tiny fishing town of Nomo. By portaging here, we took a 3km short-cut. Several aging inhabitants of the town expressed some interest and enthusiasm in our adventure as we explained to them why we were carrying our boats through the town’s narrow streets. 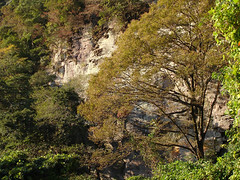 Wrapping around the rocky south end of Kaba-shima, and leaving the coast at the cliffy, cave-ridden cape that is the closest point to Amakusa, we set off back across the 21km traverse. 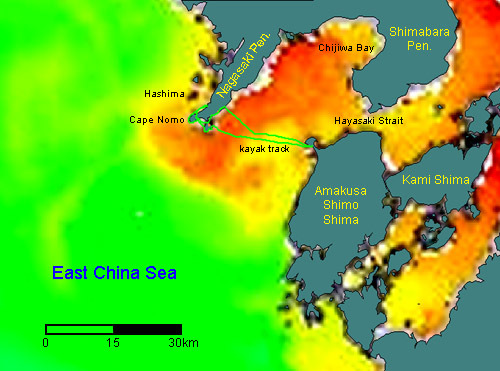 Amakusa's west coast is 20km distant as we begin the traverse back across calm water. On the way the seas were calm and we were treated to the sight of a juvenile hammerhead shark, its dorsal fin and tail cutting the water’s surface in crazy meanders, probably in search for food. He promptly disappeared as we got closer, our kayaks being several times larger than he. It was mid-afternoon of another baking-hot day as we pulled up at the public beach in Tomioka. Here too, many bathers were now cooling themselves off in the water. Taking a cooling dip ourselves, we gained confidence for our many planned crossings in Okinawa, having managed to paddle two long days in stifling heat without suffering from heat exhaustion. Recently on Saturday mornings before work, we have been going on bike trips with a group of dedicated cyclist. Every time we explore a different area, with a mix of paved roads, dirt roads, single track and sometimes even a little hiking while carrying our bikes. 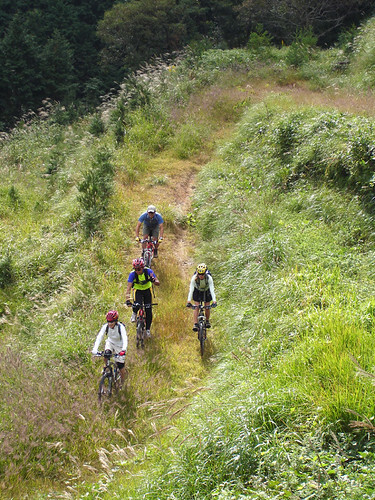 This Saturday morning we got up bright and early, packed up our mountain bikes in a few cars and drove to Kawaura. Our trip included a stretch on a new road in Sakitsu, which we had discovered the previous year. At that time when we first biked it we couldn't believe what a crazy unnecessary road it was, following an impossible line, contouring a steep mountainside. The amount of concrete used to create the road was really flabbergasting. 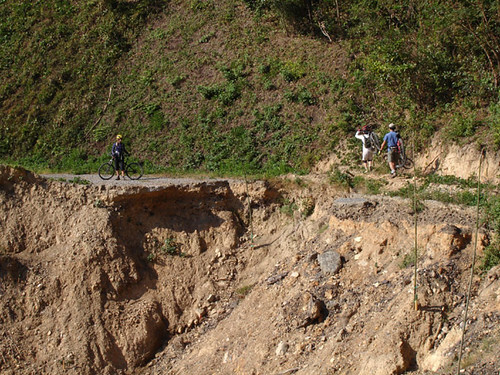 This year, we found the road in disarray, at least 6 major landslides which seem irreparable. 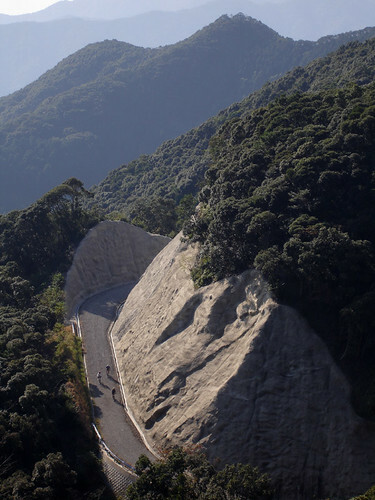 The slides themselves are due to the cutting of the mountain during the road construction. What a tragic misuse of tax money! Not only a big waste of money but an environmental disaster. Climbing season over the past couple months has been picture perfect. Every weekend has been dry and warm, ideal for climbing. Finally last Monday, the autumn weather cycle kicked in, bringing with it unstable conditions and lower temperatures. All good things eventually have to come to an end. 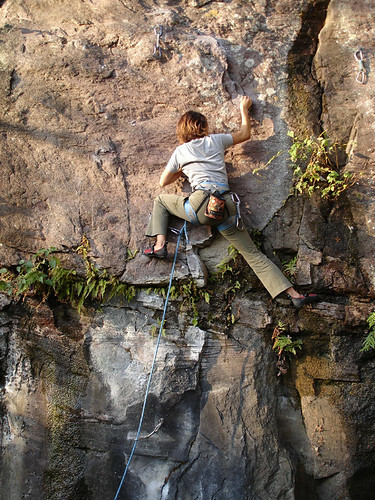 Here is our friend Misako figuring out the moves on the famous "Higashi Route"; perhaps Nodake's most beautiful route.